The Fine Arts Commission was appointed in November 1841 to consider the decoration of the newly rebuilt Houses of Parliament, with a view to 'promoting and encouraging the Fine Arts' in England. The Palace of Westminster had been burnt down in a spectacular fire in 1834, and had forced on the state a large measure of public patronage of the arts. In 1835 a Royal Commission had chosen Charles Barry as the architect of the new Palace, after a widely advertised competition, and by 1840 his building was far advanced enough to consider the question of suitable decoration. With the growth of interest in history painting, stimulated by the successes of the French and German schools, the time seemed ripe for an ambitious series of murals celebrating the nation's achievements. 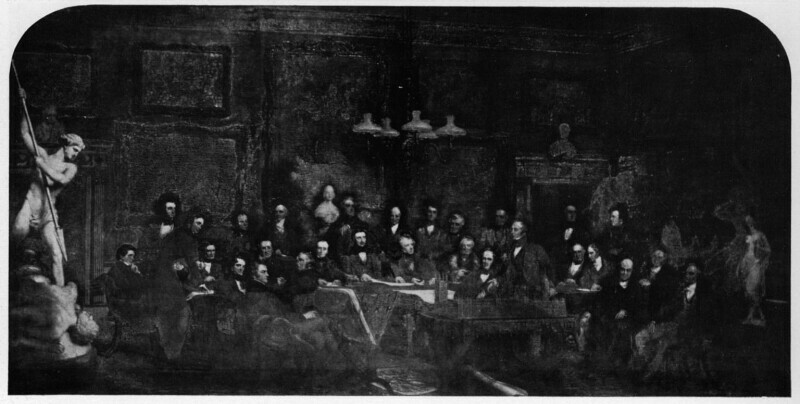 A select committee of 1841, called together to consider the whole issue, listened to a number of expert witnesses, and discussed a variety of questions, for instance, the most suitable technique for mural painting, the most appropriate subjects, and the best method of selecting artists. They recommended that a commission should be set up to deal with the whole question of decoration for the new building. Peel, the prime minister of the day, appointed Prince Albert as the president of the Commission (it was a suitably safe and unpolitical field of activity for the young and inexperienced Prince), and Charles Eastlake, probably the most knowledgeable art historian of his time, as secretary. The Commission included a number of figures who had already sat on the Committee, or had been called as witnesses: Sir Robert Peel; Sir Robert Inglis, a Tory MP and a vice-president of the Society of Antiquaries; Lord Francis Egerton, the great collector; Benjamin Hawes, an MP, on whose motion the Select Committee of 1841 had been set up; Thomas Wyse, a traveller, scholar and educational reformer; Henry Gaily Knight, a traveller and author of several architectural books; and George Vivian, who had been on the Commission of 1835 which selected Barry as the architect. The Commission included a number of statesmen and politicians: the Marquess of Lansdowne; the Duke of Sutherland; Viscount Morpeth (later Earl of Carlisle); Viscount Melbourne; Sir James Graham; the Earl of Aberdeen; Viscount Canning (later Earl Canning); Viscount Palmerston; Lord John Russell; Lord Lyndhurst; Charles Shaw-Lefevre (later Viscount Eversley); and the Earl of Lincoln (later Duke of Newcastle). Two military men were included, Lord Colborne and Lord Willoughby De Eresby; the financier, Lord Ashburton; the historians, Thomas Macaulay, Viscount Mahon (later Earl Stanhope), and Henry Hallam; the poet, Samuel Rogers; and the architect, Charles Barry. The whole history of the Commission - the competitions it organized, the artists and subjects it selected, the frescoes and statues that were actually completed - is extremely complicated, and was attended with endless problems and controversies, not least the enormous volume of comment in the public press. It is discussed in great detail in T. S. R. Boase's excellent article, 'The Decoration of the New Palace of Westminster, 1841-1863', Journal of the Warburg and Courtauld Institutes, XVII (1954), 319-58, on which this short description is largely based. If, in the final analysis, the attempt to create a form of high art, in keeping with the spirit of the new Victorian Age, was, almost inevitably, a failure, and no more than an interesting incident in the history of English art, it was the most notable example of state patronage in England since the Middle Ages. A list of the works of art depicted is given in the Burlington Magazine. 1 Aberdeen, George Hamilton Gordon, 4th Earl of (1784-1860). 2 Albert, Francis Charles Augustus Emmanuel, Prince Consort (1819-61). 3 Ashburton, Alexander Baring, 1st Baron (1774-1848). 4 Barry, Sir Charles (1795-1860). 5 Canning, Charles John Canning, Earl (1812-62). 6 Carlisle, George William Frederick Howard, 7th Earl of (1802-64) (at the time of this picture he was Lord Morpeth). 7 Colborne, Nicholas William Ridley-Colborne, 1st Baron (1779-1854). 8 Eastlake, Sir Charles Lock (1793-1865). 9 Eversley, Charles Shaw-Lefevre, Viscount (1794-1888) (at the time of this picture he was still a commoner). 10 Graham, Sir James Robert George, Bart (1792-1861). 12 Hawes, Sir Benjamin (1797-1862). 13 Inglis, Sir Robert Harry, Bart (1786-1855). 14 Knight, Henry Gally (1786-1846). 15 Lansdowne, Sir Henry Petty-Fitzmaurice, 3rd Marquess of (1780-1863). 16 Lyndhurst, John Singleton Copley, the younger, Baron (1772-1863). 17 Macaulay, Thomas Babington Macaulay, 1st Baron (1800-59). 18 Melbourne, William Lamb, 2nd Viscount (1779-1848). 19 Newcastle, Henry Pelham Fiennes Pelham-Clinton, 5th Duke of (1811-64) (at the time of this picture he was the Earl of Lincoln). 20 Palmerston, Henry John Temple, 3rd Viscount (1784-1865). 21 Peel, Sir Robert, Bart (1788-1850). 23 Russell, Lord John, 1st Earl (1792-1878). 24 Stanhope, Philip Henry, 5th Earl (1805-75) (at the time of this picture he was Lord Mahon). 25 Sutherland, George Granville Sutherland-Leveson-Gower, 2nd Duke of (1786-1861). 27 Willoughby de Eresby, Peter Robert Drummond Willoughby, 22nd Baron (1782-1865). 28 Wyse, Sir Thomas (1791-1862). 1) This is borne out by two letters written by Macaulay. In the first, to an unidentified correspondent (30 May 1849, collection of Dr A. N. L. Munby, Cambridge), he writes: 'One of the pictures for which I am sitting contains numerous figures, and will, when it is finished, be the property of His Royal Highness Prince Albert'. In the second to J. E. Denison (25 April 1853, collection of Colonel W. M. E. Denison, on loan to the University of Nottingham), he writes: 'I am sitting to another artist for a group which Prince Albert has ordered'. That this was NPG 342 is proved by an entry in Macaulay's 'Journal' (26 April 5853, Trinity College, Cambridge): 'lost the morning in sitting to Partridge'. I am most grateful to Thomas Pinney of Pomona College, California, for pointing out these references. They are not included in the Burlington Magazine article. 2) See Partridge's pamphlet, 'On the Constitution and Management of the Royal Academy' , in which he airs his grievances. R. L. Ormond, ‘John Partridge and the Fine Arts Commissioners’, Burlington Magazine, CIX (1967), 397-402.